Bali, the Island of the Gods, is one of the famed Indonesia’s islands and has become the top destination for millions of visitors all year round, how could it not? With picturesque landscape of hills and mountains, stunning coastlines and sandy beaches, lush rice terraces and endless palm trees along with its deeply spiritual and strong unique culture stake a well-deserved claim to being a paradise on earth, not to mention just in the previous year, Bali was crowned as world’s best destination in the prestigious TripAdvisor Travelers’ Choice Awards. “Bali has proven to be the Best Tourist Destination in the World encompassing all kinds of traveler’s holiday interests. 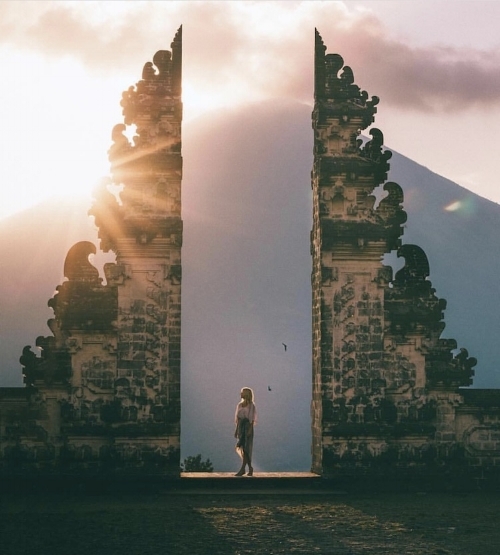 Whether in natural attractions, cultural richness and gastronomic adventures, these can all be enjoyed in many spots throughout the Island of Bali.” said Sarah Matthews, Head of TripAdvisor APAC Destination Marketing. To welcoming the new year, Bisma Eight celebrates and praises what the island truly is about by showcasing its arts and culture, from ancient landmarks to natural treasures, from the legacy of craftsmanship to its spiritual attribution, and last but not least of all the amazing things about Bali, yes, its diverse arts in culinary where all will be exhibited for guests to watch and see up close and personal at the rooftop areas to share once again the captivating journey of the Bali island, the Island of the Gods, the Bali we all love. 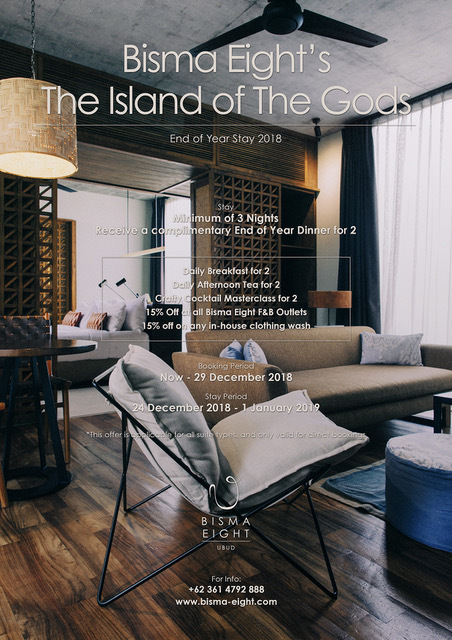 If you’re planning to end the year on a high note and soak up some island sun in a swanky infinity pool drenched with the cultural richness of Bali, come stay at Bisma Eight with a minimum of 3 nights on December 24th through the first day of the new year, and once you book, you’re immediately entitled of a complimentary end of year dinner for 2 at the award winning rooftop restaurant, Copper Kitchen, Bar & Rooftop. Enjoy the holidays the Island way. Email us at reservations@bisma-eight.com or call us at +623614792888 for further inquiries. T&C: Offer is valid for direct booking only and reservations made through December 29th, 2018 for eligible stays from December 24th to January 1st, 2019. One nightly rate payment for the reservation is due at the time of booking. All offers are subject to availability at the time of reservation. Offer is not valid in conjunction with any other offer or contract. Rates are per room, per night, vary by arrival date and/or length of stay, and do not include applicable taxes, service charges, nor surcharges, unless otherwise noted. Rates are subject to change. Remember to immediately receive super benefits and always save more every time you book direct with us.